This in-depth blog post will cover business capabilities, their attributes, use cases, and tips to use them in your daily practice. A capability model describes the complete set of capabilities an organization requires to execute its business model or fulfill its mission. Another way to think of business capability modeling is to think about capabilities as organizational level skills embedded in people, process, and/or technology. Business Capabilities serve as a placeholder to reflect the primary dimension of the needs of the business. Why is the view of business capabilities important? Most modern companies might have goals around ensuring customer satisfaction. “Manage customer satisfaction” is a directive that tells us what we need to do, but doesn’t specify how to do it. Is this the role of the Community Manager? What processes do we have to support this directive? There could be a Customer Success department process for reaching out to current customers and taking surveys. Or it could be in the hands of the Head of Partnerships to actively manage customer risk. Or this process could be outsourced to customer success robots. Each scenario requires different people, processes, and technology to achieve the ‘Manage customer satisfaction’ goal. Many times unorganized companies will have both the Community Manager and Customer Success department focusing on this task, which wastes both money, time, and confuses the customer. On the other hand, if a company creates a business capability map, they will be able to directly see which people, processes, and technology are supporting the ‘Manage customer satisfaction’ goal. 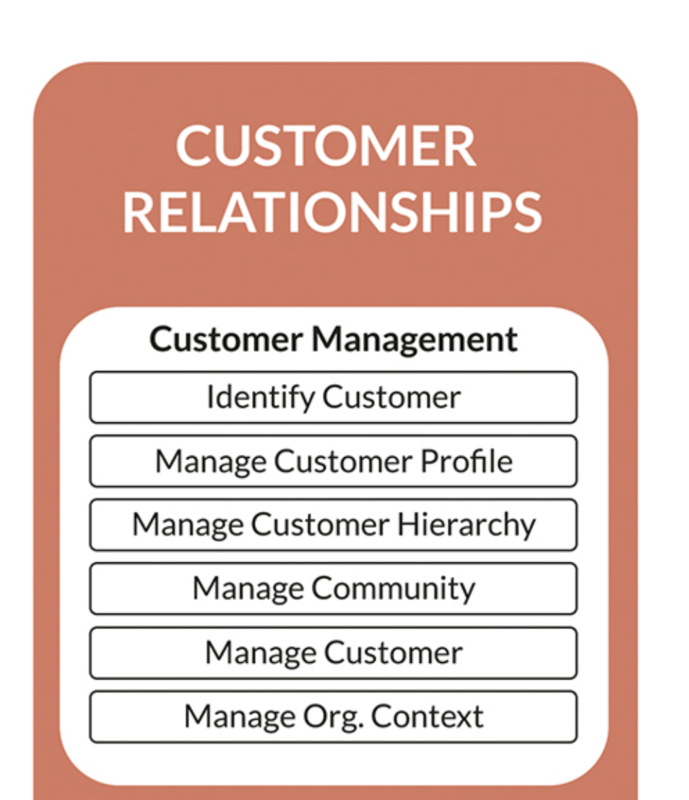 “Manage customer satisfaction” comprises the people (Customer Success Representative), the process (e.g., identify the customer, manage customer profile, manage customer hierarchy, etc.) and technology (e.g., surveys, online assessment center, digital personnel file) into one capability of the organization. Figure 1: An example of a business capability in the customer relationships function. A capability is a crucial element of the organization and as such is clearly different from other capabilities. A capability might be applied throughout the organization and can be applied in different ways to bring about different outcomes. Well-defined capabilities seldom change. The business capabilities provide a much more stable view of organizations than do projects, processes, applications, or even strategies. 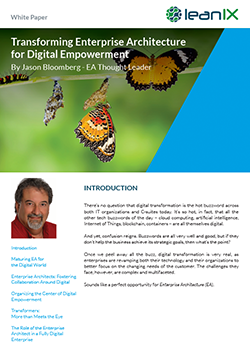 Capabilities only change when there is a significant shift in the underlying business model or mission which might occur through a business transformation initiative or in conjunction with a new merger or acquisition. For example: Amazon started as an online book retailer and developed into one of the world’s largest marketplaces, hosts over 4,000 titles on Amazon Prime, and offers top-tier cloud storage. Still, capabilities are constant enough to build a plan around them. This stability is a major part of the appeal of business capabilities. Capabilities are abstracted from the organizational model. Capability models are not just a simple restatement of the enterprise’s organizational model. They are organizationally neutral which means that changes in the organizational structure don’t require a change in the capability model. In simple organizations, the capability model may indeed look similar to the corporate organizational structure; however, in more-complex organizations capabilities both common to and unique to organizational units are found. A KPMG study indicates that 83% of merger deals did not boost shareholder returns. Mismanagement of risk, price, strategy, cultures, or management capacity are among the many contributing factors. A great way for two established organizations to completely integrate, is to fully map out the business capabilities for both organizations. Example: Global manufacturing company Haworth acquired a portfolio of brands in Europe and Asia. During their merger process, Haworth realized that their business projects frequently suffered from a lack of transparency. Due to siloed data, collecting appropriate information required strenuous efforts, which in turn negatively impacted project timelines and budgets. Improper consolidation after acquiring the portfolio had negative effects on daily operations as well as on external stakeholders. After a decade of global acquisitions, Haworth needed to define a business capability map to see which capabilities were sufficiently covered, and which were unsupported. Haworth began with aligning company-wide business capabilities for the finance function. As a result, the different projects had easy access to interactive reports that easily answered questions like: Which applications are used in Italy for billing? Which external partners are connected to said application? Which HR applications are being used in Boston? How many instances are being used of the same HR application? Haworth completed their business capability maps for each function, including Marketing & Sales, Customer Relationships, Production, Product & Service Development, Design, etc. After completion of the project, various teams inside of Haworth were able to create clear roadmaps to transform their current IT landscape to the desired target state. Do my applications meet the regulatory standards? 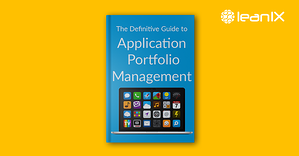 Which applications support critical business activities? Which IT components would fail if a certain application fails? Figure 2: Example of a risk dependency map: Tracing of failure of an IT component to the affected business capabilities and indicating potential financial damage. With data breaches occurring almost weekly, security is a crucial issue and proves to be a significant challenge for the IoT. Poorly designed devices can expose a user’s data to theft, harm their personal safety, and pose a significant risk for rights violations. 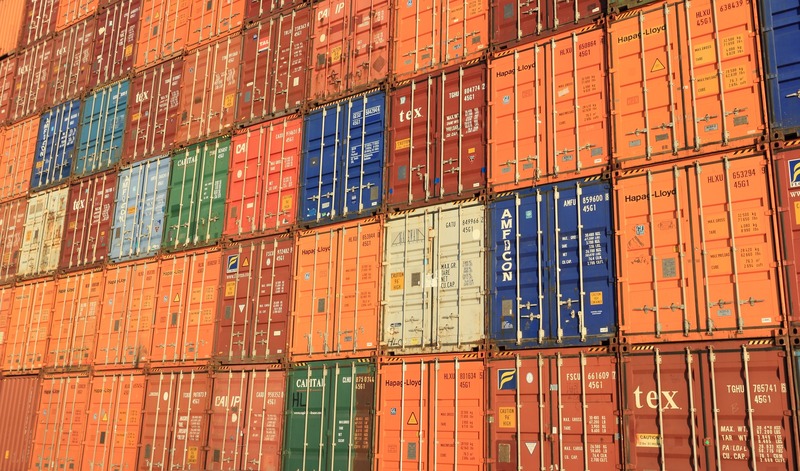 The United States Federal Trade Commission has outlined a list of concerns about the security and privacy of connected and embedded devices. The FTC went on record acknowledging that IoT devices are capable of collecting, transmitting, and sharing highly sensitive information. As a brand-new technology framework, the IoT world has a lack of set standards. This lack of documented standards leaves the door open for inappropriate behavior by IoT devices. 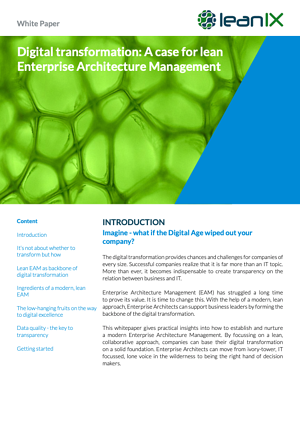 Adapting to a different IT architecture can prove to be difficult. Having an IoT roadmap will keep you from adding valueless technology to your landscape. A business capability map provides the basis for creating a clear business and IT alignment. Business capability maps help to define a list of priorities for application support, draw a common language between business and IT, and relate IoT requirements to existing business capabilities. With the LeanIX business capability map, Enterprise Architects can identify the current applications supporting the IoT capabilities, detect gaps in the application support, evaluate the quality of capability support based on defined criteria, develop requirements for existing applications, and identify the need for enhancements or new applications. Click here for a high resolution version of the poster. First, you should review the company’s strategy and goal documents, and involve the appropriate strategy owners. If there is no formal strategy defined, consider preempting a discussion with the IT and business executives for their key priorities. Think about which capabilities your business requires to properly operate. Shoot for 7-10 capabilities on the highest level. The two ways to approach this strategization include: Top-down: what does the company want to achieve? Bottom up: which organizations, processes, and people are already in place? Which functions do/can they support? During this stage, resist the urge to add numerous capabilities. Stick to the core capabilities. When in doubt, aim for breadth over depth. Not all business capabilities are of equal importance. Some are more necessary in terms of value for the customer and financial impact. For example, the capability “Manage M&A strategy” would directly impact business and IT function more than “Recruit New Staff.” Create a hierarchy for your business capabilities using the Business Capability Matrix. 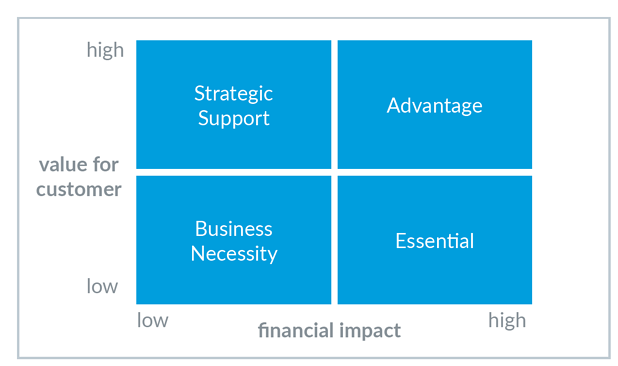 Figure 4: Business capability matrix. 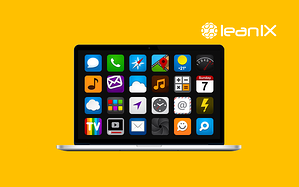 LeanIX representation based on Accelare Consulting, 2014, Putting Business Capabilities to work. This link creates a bridge between business and IT. 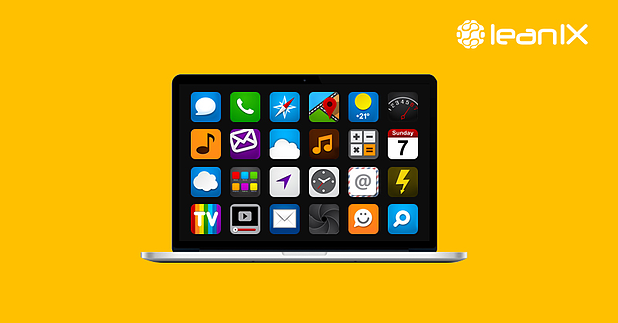 Link your applications to the business capability that they support. Modern Enterprise Architecture tools make this an easy task and provide best-practice visualizations. A great way to get a complete overview is to depict business capabilities as nested boxes that contain the assigned applications. See below for an example. 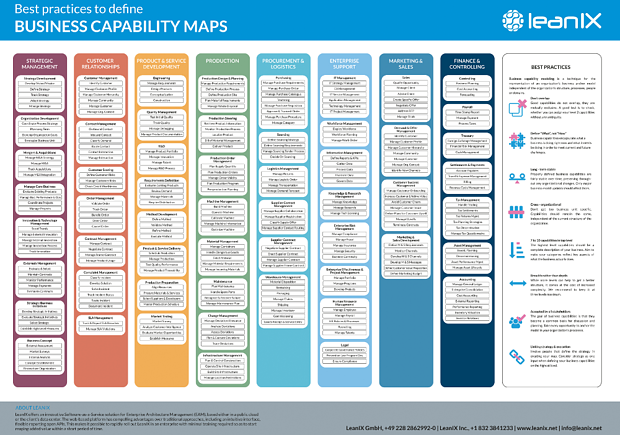 The business capability map should not lay stagnant in a PDF form. The goal of business capabilities is that they become a commonly used basis for discussion and planning. Anchor the model in your organization’s processes and governance. Refer to it, when you discuss how IT links to business. Business capabilities have the potential to serve as the common language between business and IT. When properly defined, they can help to save money, decrease risk and enable growth. 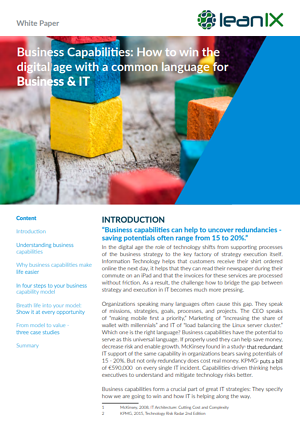 The reduction of redundant IT support for capabilities has a savings potential of 15 - 20%. IT risks are estimated to cost companies €590,000 per incident. Business capabilities encapsulate what a business is doing right now and what it needs to be doing in order to meet current and future challenges. As they are fairly stable over time, they are much more tangible than business strategy and have the potential to overcome organizational silos. Consider using business capabilities to organize your business and IT landscape.